Today, 31st August, marks the anniversary of the birth of Jahangir, born Mirza Nur-ud-din Beig Mohammad Khan Salim in 1569. He became the fourth Mughal emperor in 1605 and reigned until his death in 1627. The representation of Jahangir, above, arrived in the Royal Asiatic Society Collections from the possession of Major-General John Staples Harriott (1780-1839). Harriott became an ensign in 1796 and arrived in India in 1798, gradually working his way up the ranks to become a Major-General in 1838. He took part in the second Maratha War, losing a leg in the Battle of Delhi. He continued to serve in India until furlough in 1817 – he had four years leave before returning to India, travelling overland via Russia and Persia, arriving in Bombay (Mumbai) in January 1822. He returned to Europe in 1828 and remained on furlough until his death in Paris in 1839. Harriott was the author of several books and articles, including an article on the possible oriental origin of gypsies, found in the Transactions of the Royal Asiatic Society, 1830. In this article he compares linguistic similarities between gypsy and Indian languages. 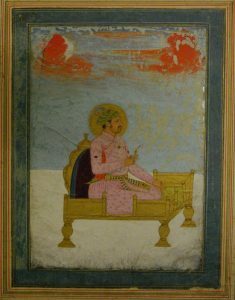 Harriott is known to have given books and manuscripts to the Society, so presumably, this painting, one of 9 Mughal miniatures once belonging to him, also formed part of one of his donations. This is the only portrait of Jahangir that we have in our Collections. We do, however, have two very different artworks, of his mausoleum in Lahore. Visitors to the Society will recognise the painting below, as it currently hangs in our Lecture Theatre and was previously in the Reading Room. This impressive painting, measuring 146 x 130 cm, was donated by Colonel Sir Claude Martine Wade (1794-1861). Slightly younger than Harriott he became a cadet in 1809 and served in the 3rd Maratha War. He became the Political Agent at Ludhiana from 1823-1839 and was also the Political Agent and resident at Malwa from 1840-2844, before retiring to England. He died in Bath in 1861. The second painting of the mausoleum was given by Herbert Charles Fanshawe (1852-1923). He was an Indian civil servant, which he joined in 1873, ending his carer on retirement in 1901 as a Member of the Legislative Council of the Governor-General of India. He also authored Murray’s Handbook to India, (1904, 1909). 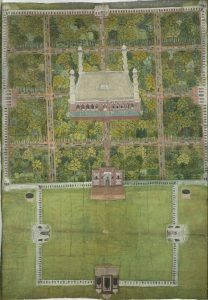 This drawing is one of 98 bound into an album with an Indian binding, which not only depict monuments of Lahore, Amritsar, Delhi and Agra, but also rulers and princes of the Punjab, and local trades and occupations. 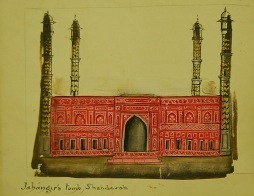 The drawings were made by a Punjabi artist working in Lahore c.1890. The album was purchased by Fanshawe in 1896 and bequeathed to the Society in 1923. 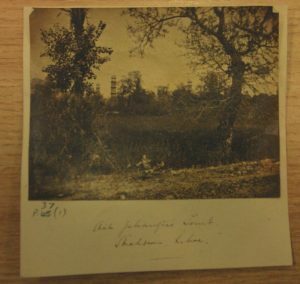 We have one further picture of Jahangir’s mausoleum – this time a small photograph dating from the second half of the nineteenth century. In fact, though it is labelled as being of the mausoleum, you can only see the turrets emerging from the foliage in the foreground of the picture. The Society also holds manuscripts which relate to the history of Jahangir. One such, RAS Persian MS.122, is Tarikh-i Jahangir-namah-i Salimi, supposedly by the Emperor Jahangir and dated A.H. 1040. The illuminated first pages of RAS Persian 122. 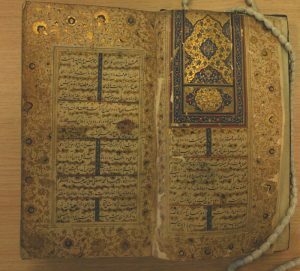 This manuscript, the so-called Garbled Memoirs of Jahangir, also contains the Pand Namah (ff127-150, as numbered) and concludes with a number of letters, petitions, etc, including correspondence with Safavid Iran (f150b-end). 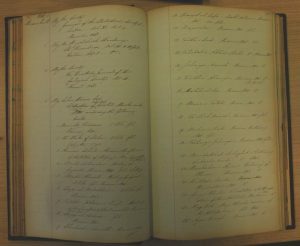 It is perhaps still the earliest known manuscript of the Garbled Memoirs and was donated by John Romer, one of 22 items that he donated on 18 November 1848. Jahangir was fascinated with art and architecture, so it is a delight, that we have some beautiful items in our Collections that are connected to him. As we head into September, the programme of events at the Society starts up again. On 12 September at 7 pm, we will host the film screening of “Saragarhi: The True Story”. In the late 19th century, tensions were heightened between Britain and Russia as the nations battled over territories in central Asia. British forces held vulnerable posts on the colonial border between British India and Afghanistan, threatened by both Russian forces and Afghan tribes. Here, Captain Jay Singh-Sohal explores the events that occurred 120 years ago this month at the battle of Saragarhi, which saw a British outpost surrounded by 10,000 Afghan tribesmen, and shares the remarkable story of a valiant last stand that would reverberate around the British empire. More details can be found on our website.